Returning to the city I'd lived in for three years after a long absence, I was after a composition that was different from all the other Golden Gate Bridge shots. 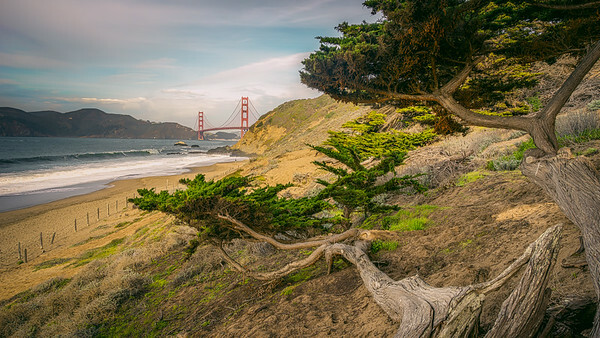 I spied these beautifully weathered trees from the beach and thought they would frame the bridge nicely making a unique composition. 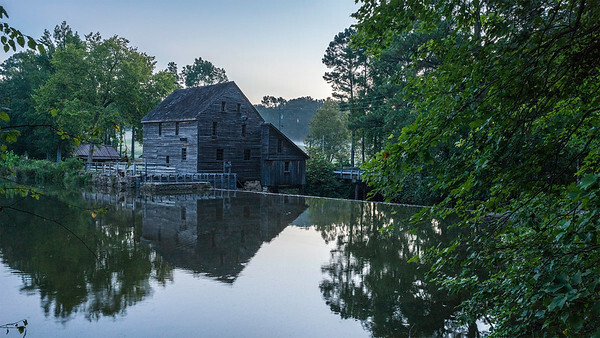 Yates Mill in Raleigh NC at dawn. The temporary tranquility of this saltwater estuary will soon be flooded with raucous birds gathering for the winter. Awoke at 3 am to drive to St Augustine. Arrived an hour before the sun rose, and scrambled through these rocks in the pitch black trying to find a composition while I awaited sunrise. This was my reward. It was 12:16 at night, just after midnight when I shot this long exposure underneath the Venice Beach Fishing Pier. With a three quarter moon behind me, and lights from above the pier shinning down on the water, and through the boards, I wound up with this ethereal image down a portal to a different world. The world welcomes a new day at Marineland Beach Florida in a spectacular way. Partly cloudy sunrise contributes to a unique, multi-colored, long exposure of a rocky shoreline at Marineland Beach, in St Augustine, FL. 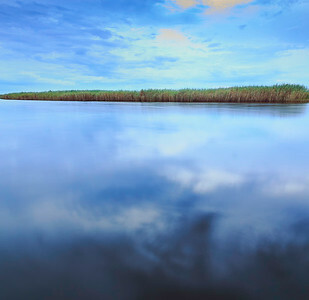 One almost can't help but be inspired with a zen-like feeling, and interpretation. 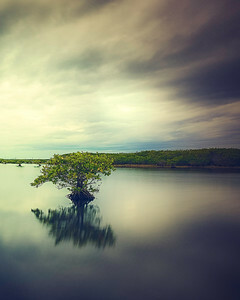 This mangrove beach tree is the last shot of the day. I had already spent hours in the hot sun shooting other parts of the park and was suffering from heat exhaustion. I cooled off in the car, re hydrated and instead off heading for home, I chanced looking further and I'm glad I did, finding this gem. I arrived to a very sunny Venice Beach Florida, a few hours from my home, around 4 in the afternoon. Very sunny. As in...not a cloud in the sky. 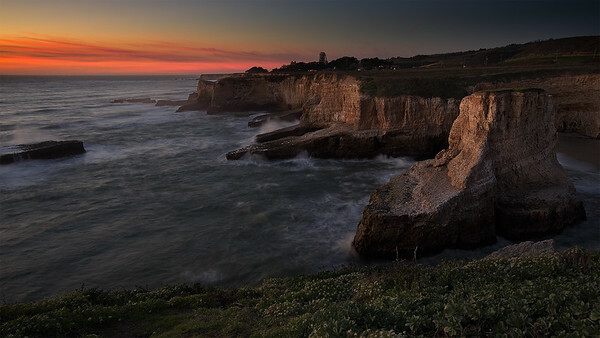 And normally that's a good thing, but not when your shooting sunset photography. You see it's the clouds in the sky, lit up by the sun, that make for spectacular west coast Florida sunsets. Rather than head for home instead I set out for the Venice Beach Fishing Pier a few miles up the coast. Still no clouds...but I had another idea. I waited until the sun set, for lights to come on, and for stars to appear. Back lit by a rising moon behind me I took this long-exposure of this twilight pier. A Foggy Sunrise on the St Johns River near Cocoa Beach sees another discussion between the early morning fog and the determined sun to see who will rule over this dominion...and until what hour. 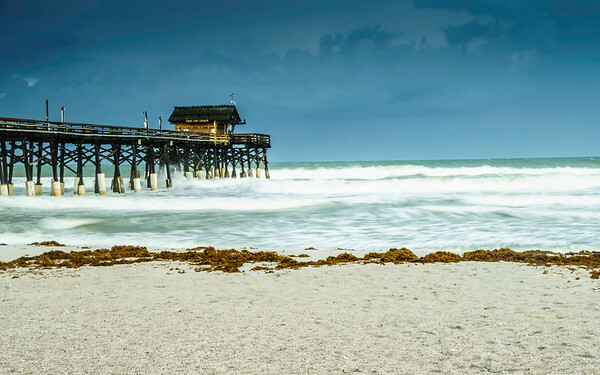 Cocoa Beach Pier greeted Tropical Storm Erika on Sunday August 30th 2015. I got to the beach at 6 am and got some sunrise shots. Then waited for a break in the rain & clouds around 8:40 for this shot of the pier. 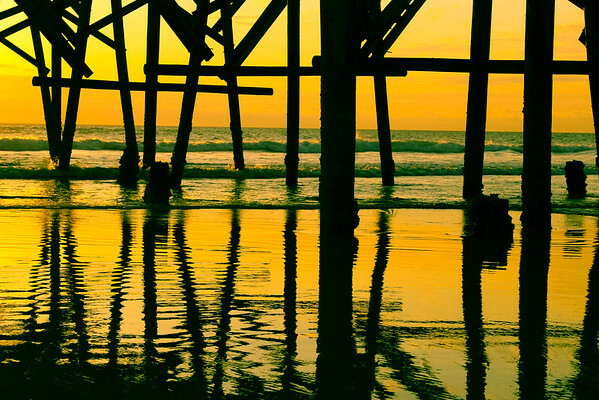 Long wavy reflections of the South Daytona Beach Pier cast against the rippled sand of an outgoing tide, elongated by the first rays of sunrise streaming just over the horizon. 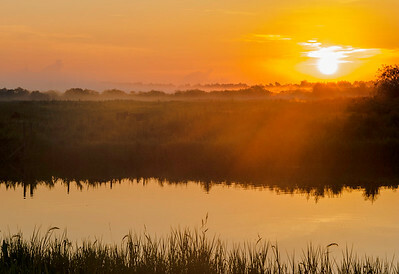 This sunrise over the bridge that runs over Lake Jesup makes me think time travel is possible. 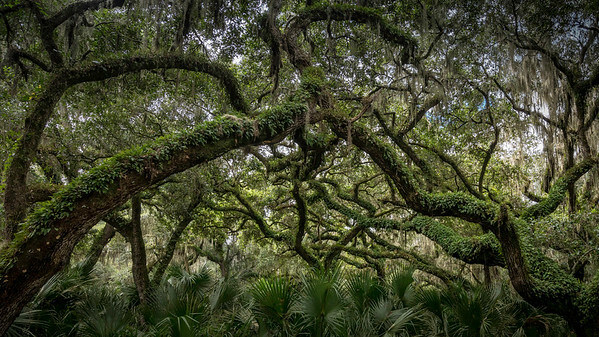 Tangled Oak trees at least 100 years old, covered in green ferns, and spanish moss, weave an intricate pattern into the forest at Marl Bed Flats, near Lake Jesup Conservation area.